John 16:21 - Whenever a woman is in labor she has pain, because her hour has come; but when she gives birth to the child, she no longer remembers the anguish because of the joy that a child has been born into the world. To hear someone say they are "expecting" needs no or very little explanation. A slight smile may form as one might whisper to another that this one or that one is expecting a child. If the pregnancy is well-advanced there is no need of any type of declaration. It is quite evident as the blush of anticipation and expectation is clearly seen on the prospective mother's face as well as the unmistakable evidence elsewhere. I can truly attest that a similar blush of excitement and anticipation was brooding over approximately 70 of us as we converged on Reynosa Mexico on the 18th of December 2009. We had all come from various parts of the country and from different backgrounds including pastors, homemakers, students, ex-convicts, and business people. How could such a variety of mixed backgrounds have anything in common? What drew us all together was the love of Jesus and the desire to share that profound relationship with the people of Mexico. The driving dynamic of this wonderful impetus was the very expectancy that God was going to birth "life and life more abundantly" in those whom we touched through Him. Consequentially, we often became the receivers as we freely gave away what He had so graciously given to us. 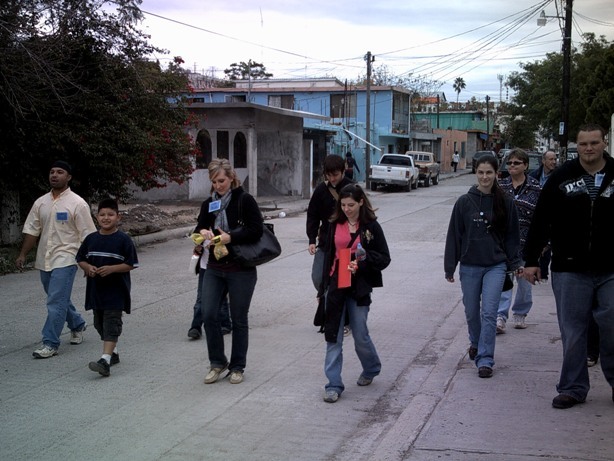 During our few short days in Reynosa, we saw God do great things. Many of us gave "birth" as we saw many saved, healed, and touched. Words of knowledge, healings, and various manifestations of God's power were evidenced in every gathering. The team that went to the juvenile detention center reported that out of 13 youths incarcerated, all 13 gave their lives to the Lord! Many were prayed over for salvation and succumbed to the power of the Holy Spirit as they lay on the dusty, concrete floors of the rural churches praising Jesus for His salvation! Several men denounced their lives of drug addiction and alcoholism as they gave their lives to the Living Lord. It was a joyous time with tears of gratitude flowing from both their eyes and ours as we ministered the love of Jesus and His transforming power. Even as we prayed and travailed in our early morning prayer meetings before each day's outreach, God was now birthing His life in demonstrable ways even as we looked on with great joy. Those of us who were not directly involved in praying others through to salvation or healing were as mid-wives that experienced the same joy while witnessing the miracles coming to life all around us. The Lord Jesus had given us all a hope and a desire to be in Reynosa to be a part of something much bigger than ourselves as individual Christians. He desired to join us together to bring a bright flame to areas of this impoverished city that desperately needed a touch from the Lord. As we allowed God to use us, stirring up the spiritual gifts within us, we then went forth in faith and hope that God was truly going to move (which He did). God's love never fails (I Corinthians 13:8) and hope does not disappoint (Romans 5:5). Going forth in His love and with the hope of expectancy creates a dynamic that is explosive and charged with God's dunamis or dynamite power. Hell quakes when believers will unite their hearts in love for the lost and then venture forth in faith and hope that they will birth the seeds being germinated by the Holy Spirit. Sometimes, we see the results quickly. In other cases, the seeds may only be lying dormant at this time for another to harvest in our absence. No matter. Only that the Lord Jesus Christ is glorified as he births sons and daughters into his kingdom through an expectancy of his great mercy and love. Oh, the joy of child birth! May we all go forth to our respective mission fields with great expectancy, making ourselves available to be used of God to birth true, lasting fruit that will remain forever and ever! Amen!